In 1492, Christopher Columbus discovered previously unknown lands to the west of Europe, and it wasn't long before the New World filled with colonists and adventurers looking to make a fortune. The Americas were full of fierce native warriors who defended their lands valiantly, but they had gold and other valuables, which were irresistible to the invaders. The men who ravaged the peoples of the New World came to be known as the conquistadors, a Spanish word meaning "he who conquers." How much do you know about the ruthless men who gave the New World to the King of Spain on a bloody platter? Although the vast majority of the conquistadors came from Spain, not all of them did. Many men from other European nations joined the Spanish in their conquest and looting of the New World. Two examples are Pedro de Candia, a Greek arquebusier and artilleryman who accompanied the Pizarro expedition, and Ambrosius Ehinger, a German who cruelly tortured his way across northern South America in 1533 in search of El Dorado. The Conquest of the Americas, closeup of mural painting by Diego Rivera. The Spanish conquistadors had many military advantages over the New World natives. The Spanish had steel weapons and armor, which made them nearly unstoppable, as native weapons could not pierce Spanish armor nor could native armor defend against steel swords. Arquebuses were not practical firearms in a fight, as they are slow to load and kill or wound only on enemy at a time, but the noise and smoke caused fear in native armies. Cannons could take out groups of enemy warriors at a time, something natives had no concept of. European crossbowmen could rain down lethal bolts on enemy troops who could not defend themselves from missiles which could punch through steel. In Mexico, conquistadors found great golden treasures, including great discs of gold, masks, jewelry, and even gold dust and bars. In Peru, Francisco Pizarro demanded that Emperor Atahualpa fill up a large room once with gold and twice with silver in exchange for his freedom. The emperor complied, but the Spanish killed him anyway. All in all, Atahualpa's ransom came to 13,000 pounds of gold and twice that much silver. This did not even count the vast treasures taken later when the city of Cuzco was looted. The common soldiers in Pizarro's army did well, each of them getting about 45 pounds of gold and twice that much silver from the emperor's ransom. Hernan Cortes' men in Mexico, however, did not make out as well. 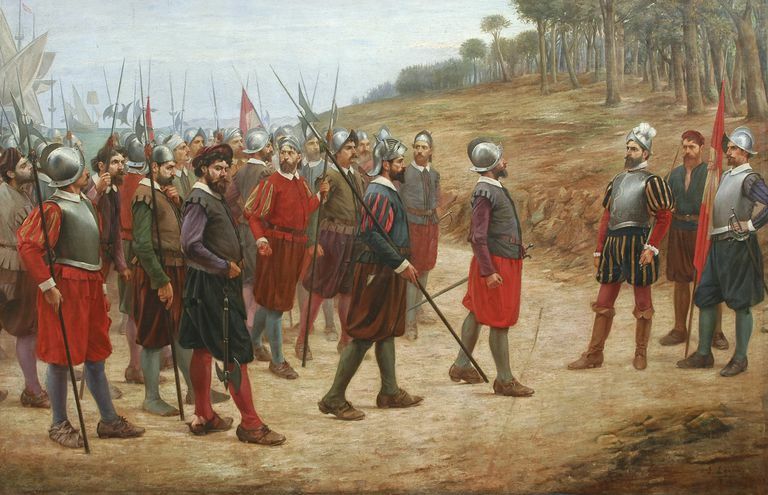 Common soldiers wound up with a paltry 160 pesos of gold after the King of Spain, Cortes, and the other officers had taken their cut and various payoffs made. Cortes' men always believed that he hid massive quantities of treasure from them. On some other expeditions, men were lucky to get home alive, let alone with any gold: only four men survived the disastrous Panfilo de Narvaez expedition to Florida which had begun with 400 men. The conquistadors were ruthless when it came to conquering native civilizations or extracting gold from them. The atrocities they committed over the course of three centuries are far too many to be listed here, but there are some that stand out. In the Caribbean, most of the native populations were completely wiped out due to Spanish rapine and diseases. In Mexico, Hernan Cortes and Pedro de Alvarado ordered the Cholula Massacre and the Temple Massacre respectively, killing thousands of unarmed men, women, and children. In Peru, Francisco Pizarro captured Emperor Atahualpa in the midst of an unprovoked bloodbath at Cajamarca. Wherever the conquistadors went, death and misery for the natives followed. Cortes meets with Tlaxcalan Leaders by Desiderio Hernández Xochitiotzin. Some may think that the conquistadors, in their fine armor and steel swords, conquered the mighty empires of Mexico and South America by themselves. The truth is that they had a lot of help. Cortes would not have gotten far without his native mistress/interpreter Malinche. The Mexica (Aztec) Empire was largely comprised of vassal states which were eager to rise against their tyrannical masters. Cortes also secured an alliance with the free state of Tlaxcala, which provided him with thousands of fierce warriors who hated the Mexica and their allies. In Peru, Pizarro found allies against the Inca among recently-conquered tribes such as the Cañari. Without these thousands of native warriors fighting alongside them, these legendary conquistadors would certainly have failed. Once word of the riches being sent out of Mexico by Hernan Cortes became common knowledge, thousands of desperate, greedy would-be conquistadors flocked to the New World. These men organized themselves into expeditions which were expressly designed to turn a profit: they were sponsored by rich investors and the conquistadors themselves often bet everything they had on finding gold or slaves. It should not be surprising, then, that squabbles between groups of these heavily-armed bandits should break out frequently. Two famous examples are the 1520 Battle of Cempoala between Hernan Cortes and Panfilo de Narvaez and the Conquistador Civil War in Peru in 1537. Many of the conquistadors who explored the New World were avid fans of popular romance novels and of some of the more ridiculous elements of historical popular culture. They even believed much of it, and it affected their perception of New World reality. It began with Christopher Columbus himself, who thought he had found the Garden of Eden. Francisco de Orellana saw women warriors on a great river: he named them after the Amazons of popular culture, and the river bears the name to this day. Juan Ponce de Leon famously searched for the Fountain of Youth in Florida (although much of that is a myth). California is named after a fictional island in a popular Spanish chivalry novel. Other conquistadors were convinced they would find giants, the devil, the lost kingdom of Prester John, or any number of other fantastic monsters and places in the unexplored corners of the New World. 1656 Map Purporting to show Lake Parima. After Hernan Cortes and Francisco Pizarro conquered and looted the Aztec and Inca Empires respectively between 1519 and 1540, thousands of soldiers came from Europe, hoping to be on the next expedition to strike it rich. Dozens of expeditions set out, searching everywhere from the plains of North America to the jungles of South America. The rumor of one last wealthy native kingdom known as El Dorado proved so persistent that it was not until about 1800 that people stopped looking for it. The conquistadors who brought down native empires are not highly thought of in the lands they conquered. There are no major statues of Hernan Cortes in Mexico (and one of him in Spain was defaced in 2010 when someone splattered red paint all over it). There are, however, majestic statues of Cuitláhuac and Cuauhtemoc, two Mexica Tlatoani who fought the Spanish, proudly displayed on Reform Avenue in Mexico City. A statue of Francisco Pizarro stood in the main square of Lima for many years but has recently been moved to a smaller, out-of-the-way city park. In Guatemala, conquistador Pedro de Alvarado is buried in an unassuming grave in Antigua, but his old foe, Tecun Uman, has his face on a banknote. Who Was Spanish Conquistador Hernan Cortes?